This study was intended for non-diabetic normotensive subjects to find out the effect of smoking on renal functions such as microalbuminuria, creatinine clearance and urinary albumin creatinine ratio (ACR). This was a community-based prospective cross-sectional cohort study conducted on 120 non-diabetic normotensive subjects as per the inclusion criteria. It was approved by the institutional ethics committee and conducted in accordance with the guidelines of the Indian Council of Medical Research, international conference on harmonization-good clinical practices instructions of drug controller general of India New Delhi and institutional SOP with a proper informed consent. Inclusion criteria were age 30-70 years, normotensive (≤139/≤89 mmHg), non-diabetic (fasting plasma glucose ≤125 mg/dl), non-obese (body mass index [BMI] <30 kg/m 2 ), no family history of premature vascular disease, normal total cholesterol level (<200 mg/dl), normal renal function (urea ≤40 mg/dl and creatinine ≤1 mg/dl), clinically well and not on any regular cardiovascular medication and given informed consent. Exclusion criteria were age less than 30 and above 70 years, diabetics or using insulin or oral hypoglycaemic agents, hypertensive or using antihypertensive medication, hyperlipidemic or using lipid lowering drugs, obese (BMI ≥30 kg/m 2 ), abnormal renal function (urea and creatinine), urinary tract infection, significant renal disease or using diuretics, angiotensin converting enzyme inhibitors, alcohol consumption or other significant drugs, fever, vigorous physical activity, menstruating/pregnant women and not willing to give consent. Smoker was defined as anyone who had smoked at least 20 bidi/day for 5 years (5 pack-years) or equivalent. Smokers were divided into four sub-groups: Very light smoker (5-9 pack-years), light smoker (10-14 pack-years), moderate smoker (15-19 pack-years) and heavy smoker (>20 pack-years). Non-smoker neither smoked nor chewed tobacco in any form. Out of 120 non-diabetic normotensive subjects, 80 (66.66%) were smokers and 40 (33.33%) were age matched non-smokers as control. The baseline physical characteristic and investigation were compared in these two groups using the statistical tests of significance (p = NS) [Table 1]. Overnight fasting blood sugar, blood urea, serum creatinine and lipid profile were measured and first morning void (timed) quantitative mid-stream urine was sample taken for screening of urinary albumin and urinary creatinine concentrations [Table 1]. Laboratory methods used included; CLINITEK Micro albumin Reagent Strips  (urinary albumin and ACR), Jaffe colorimetric method (serum creatinine concentration), glucose enzymatic colorimetric (glucose oxidase/peroxidase) method (plasma glucose), enzymatic colorimetric cholesterol (cholesterol oxidase/peroxidase aminophenazone) method (serum lipid profile), urine analyzer URISCAN Optima II + Combistix SG, Korea (urinary leukocyte and erythrocyte). All calculations were performed with the Statistical Package for the Social Sciences (SPSS) version 9.0 (SPSS, Chicago, USA) software by Chi-square analysis or analysis of variance. Out of 120 non-diabetic normotensive subjects, 80 (66.66%) were smoker and 40 (33.33%) were non-smoker. 83 subjects (69.16%) were male and 37 subjects (30.83%) were female. The mean age in smoker group was 48.68 ± 11.82 years and in non-smoker group was 46.10 ± 10.77 years, ranged from 30 to 70 years (P = 0.247) [Table 1]. The two groups were comparable in terms of all parameters except high-density lipoprotein (HDL) level (P = 0.031) [Table 1]. 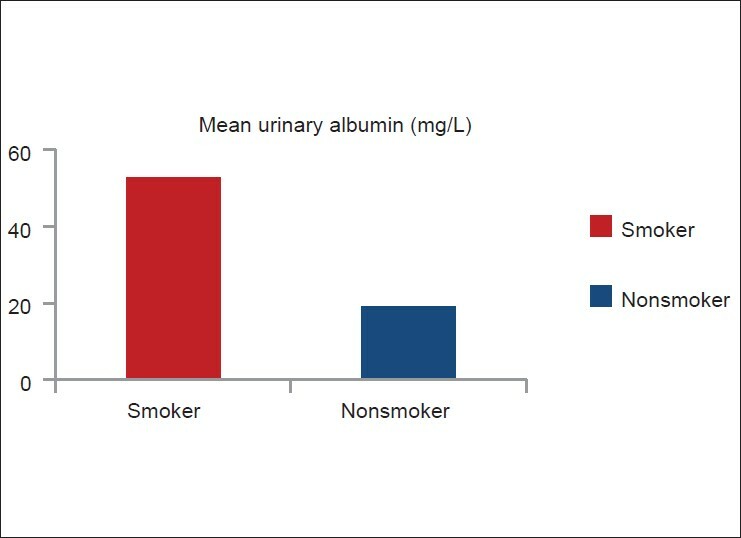 Smokers had higher mean urinary albumin level (52.84 mg/L) than non-smokers (19.25 mg/L) (P < 0.0001) [Figure 1]. Among smokers (n = 80), microalbuminuria was directly related to the amount of smoking (pack-years) [Figure 2]. 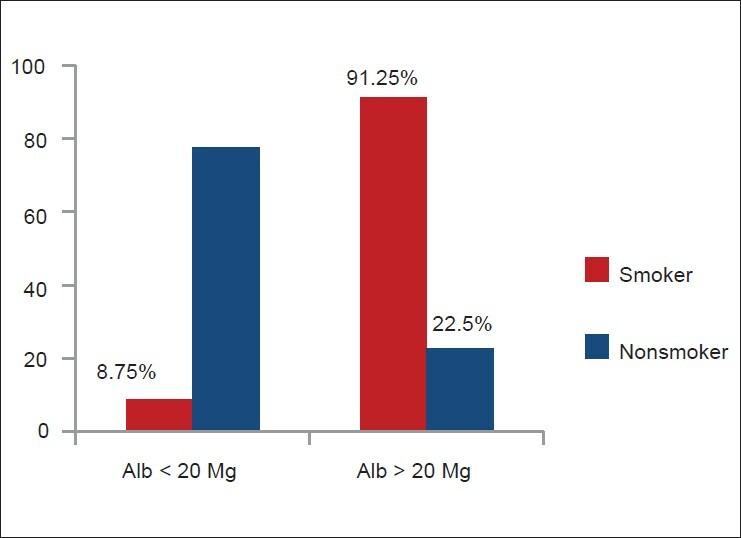 Seventy three smokers (91.25%) and nine non-smokers (22.5%) had urinary albumin level > 20 mg/L (microalbuminuria). 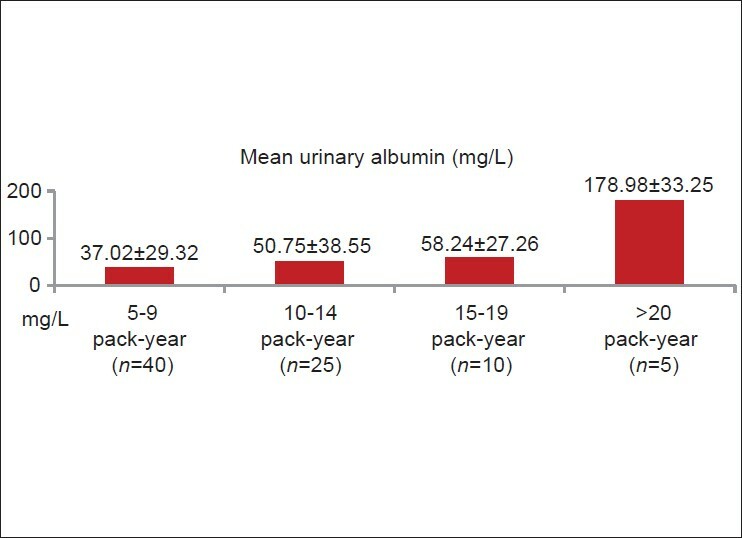 Seven smokers (8.75%) and 31 non-smokers (77.5%) had urinary albumin level < 20 mg/L [Figure 3]. 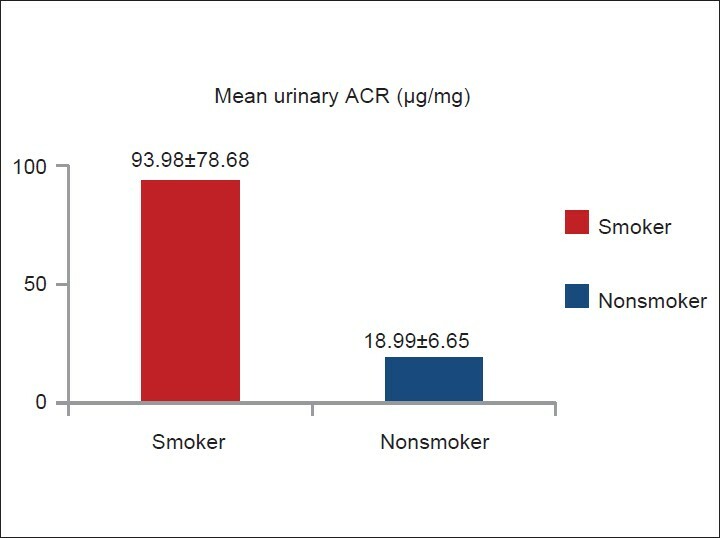 Smoker (n = 80) had higher mean urinary ACR (93.98 μg/mg) than non-smoker (n = 40, 18.99 μg/mg) (P < 0.001) [Figure 4]. 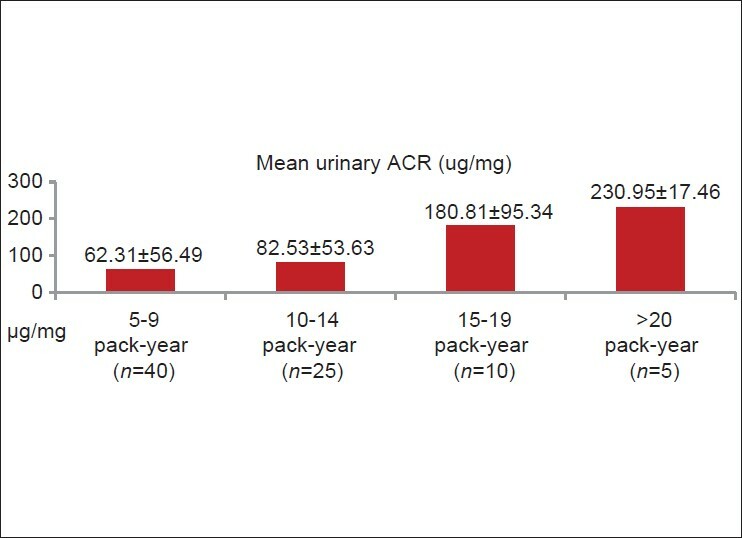 Among smokers (n = 80), urinary ACR level was directly related to the amount of smoking (pack-years) [Figure 5]. Sixty four smokers (80%) and two non-smokers (5%) had urinary ACR level >30 μg/mg. 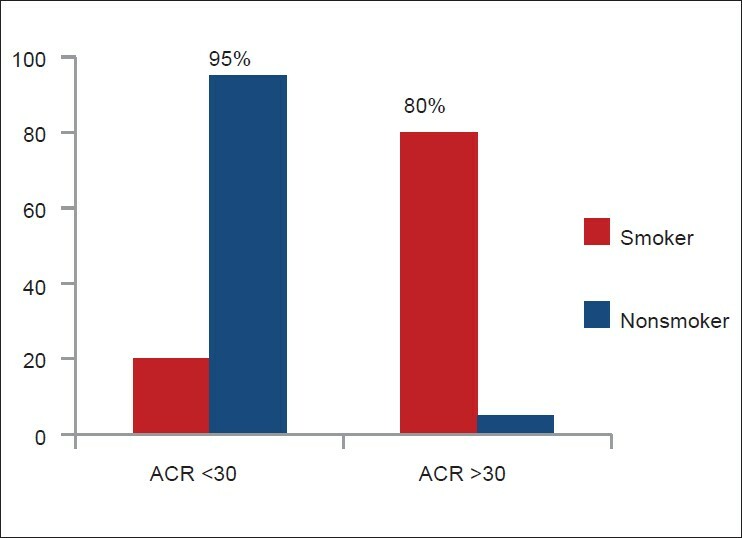 Only 16 smokers (20%) and 38 non-smokers (95%) had urinary ACR <30 μg/mg [Figure 6]. Male and female smokers had no statistically significant distribution of urinary albumin, urinary creatinine and urinary ACR (p = NS). This study shows non-diabetic normotensive smoker had higher mean urinary albumin level, which is directly related to the amount of smoking (pack-years) among smokers. Also, more smokers had microalbuminuria, which signify smokers have 4-fold higher prevalence of microalbuminuria than non-smokers. Among smokers, both male and female had comparable urinary albumin, urinary creatinine and urinary ACR (P = NS), which signifies that the effect of smoking on renal function is not affected by gender. However, limitations of this study are a small number of subjects, single center data and screening with one timed urine sample, it is in comparison with one of the many ongoing prevention of renal and vascular end stage disease (PREVEND) group studies , (PREVEND), running in the city of Groningen, the Netherlands (n = 7476) with the mean age of smoker (47 ± 12 years who smoke <20 cigarette/day, 46 ± 10 years who smoke > 20 cigarette/day) and non-smoker (47 ± 13 years). This area of research needs further attention of physicians and nephrologists, looking to the highly prevalent smoking addiction in Indian community as an independent risk factor and its impact on renal function, therefore; more such studies can be planned at various centers. Non-diabetic normotensive smokers have significantly higher level of urinary albumin and urinary ACR than non-smoker, which is directly proportional to quantity of smoking. Similarly, smokers have a higher prevalence of 4-fold for microalbuminuria and 16-fold for increased urinary ACR than non-smokers. Smoking significantly reduces the HDL level; however, no significant effect on serum creatinine and creatinine clearance. 1. Salonen JT, Salonen R. Ultrasound B-mode imaging in observational studies of atherosclerotic progression. Circulation 1993;87 (3 Suppl):II56-65. 2. Orth SR, Ritz E, Schrier RW. The renal risks of smoking. Kidney Int 1997;51:1669-77. 3. Mimran A, Ribstein J, DuCailar G, Halimi JM. Albuminuria in normals and essential hypertension. J Diabetes Complications 1994;8:150-6. 4. Hörner D, Fliser D, Klimm HP, Ritz E. Albuminuria in normotensive and hypertensive individuals attending offices of general practitioners. J Hypertens 1996;14:655-60. 5. Biesenbach G, Janko O, Zazgornik J. Similar rate of progression in the predialysis phase in type I and type II diabetes mellitus. Nephrol Dial Transplant 1994;9:1097-102. 6. Graziani MS, Gambaro G, Mantovani L, Sorio A, Yabarek T, Abaterusso C, et al. Diagnostic accuracy of a reagent strip for assessing urinary albumin excretion in the general population. Nephrol Dial Transplant 2009;24:1490-4. 7. Gerstein HC, Mann JF, Pogue J, Dinneen SF, Hallé JP, Hoogwerf B, et al. Prevalence and determinants of microalbuminuria in high-risk diabetic and nondiabetic patients in the heart outcomes prevention evaluation study. The HOPE study investigators. Diabetes Care 2000;23 Suppl 2:B35-9. 8. Pinto-Sietsma SJ, Mulder J, Janssen WM, Hillege HL, de Zeeuw D, de Jong PE. Smoking is related to albuminuria and abnormal renal function in nondiabetic persons. Ann Intern Med 2000;133:585-91. 9. Hillege HL, Janssen WM, Bak AA, Diercks GF, Grobbee DE, Crijns HJ, et al. Microalbuminuria is common, also in a nondiabetic, nonhypertensive population, and an independent indicator of cardiovascular risk factors and cardiovascular morbidity. J Intern Med 2001;249:519-26. 10. Wachtell K, Olsen MH, Dahlöf B, Devereux RB, Kjeldsen SE, Nieminen MS, et al. Microalbuminuria in hypertensive patients with electrocardiographic left ventricular hypertrophy: The LIFE study. J Hypertens 2002;20:405-12. 11. Esposito C, Gerlach H, Brett J, Stern D, Vlassara H. Endothelial receptor-mediated binding of glucose-modified albumin is associated with increased monolayer permeability and modulation of cell surface coagulant properties. J Exp Med 1989;170:1387-407. 12. Vlassara H, Fuh H, Makita Z, Krungkrai S, Cerami A, Bucala R. Exogenous advanced glycosylation end products induce complex vascular dysfunction in normal animals: A model for diabetic and aging complications. Proc Natl Acad Sci U S A 1992;89:12043-7. 13. Brownlee M, Cerami A, Vlassara H. Advanced glycosylation end products in tissue and the biochemical basis of diabetic complications. N Engl J Med 1988;318:1315-21. 14. Makita Z, Bucala R, Rayfield EJ, Friedman EA, Kaufman AM, Korbet SM, et al. Reactive glycosylation endproducts in diabetic uraemia and treatment of renal failure. Lancet 1994;343:1519-22. 15. Makita Z, Radoff S, Rayfield EJ, Yang Z, Skolnik E, Delaney V, et al. Advanced glycosylation end products in patients with diabetic nephropathy. N Engl J Med 1991;325:836-42. 16. Cerami C, Founds H, Nicholl I, Mitsuhashi T, Giordano D, Vanpatten S, et al. Tobacco smoke is a source of toxic reactive glycation products. Proc Natl Acad Sci U S A 1997;94:13915-20. 17. Facchini FS, Hollenbeck CB, Jeppesen J, Chen YD, Reaven GM. Insulin resistance and cigarette smoking. Lancet 1992;339:1128-30. 18. Attvall S, Fowelin J, Lager I, Von Schenck H, Smith U. Smoking induces insulin resistance - A potential link with the insulin resistance syndrome. J Intern Med 1993;233:327-32. 19. Eliasson B, Attvall S, Taskinen MR, Smith U. The insulin resistance syndrome in smokers is related to smoking habits. Arterioscler Thromb 1994;14:1946-50. 20. Forsblom CM, Eriksson JG, Ekstrand AV, Teppo AM, Taskinen MR, Groop LC. Insulin resistance and abnormal albumin excretion in non-diabetic first-degree relatives of patients with NIDDM. Diabetologia 1995;38:363-9. 21. Park SK, Kang SK. Renal function and hemodynamic study in obese Zucker rats. Korean J Intern Med 1995;10:48-53. 22. Fliser D, Pacini G, Engelleiter R, Kautzky-Willer A, Prager R, Franek E, et al. Insulin resistance and hyperinsulinemia are already present in patients with incipient renal disease. Kidney Int 1998;53:1343-7. 23. Kiowski W, Linder L, Stoschitzky K, Pfisterer M, Burckhardt D, Burkart F, et al. Diminished vascular response to inhibition of endothelium-derived nitric oxide and enhanced vasoconstriction to exogenously administered endothelin-1 in clinically healthy smokers. Circulation 1994;90:27-34. 24. Nitenberg A, Antony I, Foult JM. Acetylcholine-induced coronary vasoconstriction in young, heavy smokers with normal coronary arteriographic findings. Am J Med 1993;95:71-7. 25. Celermajer DS, Sorensen KE, Georgakopoulos D, Bull C, Thomas O, Robinson J, et al. Cigarette smoking is associated with dose-related and potentially reversible impairment of endothelium-dependent dilation in healthy young adults. Circulation 1993;88:2149-55. 26. Warram JH, Gearin G, Laffel L, Krolewski AS. Effect of duration of type I diabetes on the prevalence of stages of diabetic nephropathy defined by urinary albumin/creatinine ratio. J Am Soc Nephrol 1996;7:930-7. 27. Fried LF, Orchard TJ, Kasiske BL. Effect of lipid reduction on the progression of renal disease: A meta-analysis. Kidney Int 2001;59:260-9. 28. Craig WY, Palomaki GE, Haddow JE. Cigarette smoking and serum lipid and lipoprotein concentrations: An analysis of published data. BMJ 1989;298:784-8.